ArcGIS provides data and maps for seamless data delivery throughout Singapore. Interactive applications are created for the public to use with ArcGIS and Java. Singapore's NSDI links 70 agencies together in data sharing. There is high demand today for geospatial data when managing government information. In the island nation of Singapore, with a population of five million and a limited land area of 710 square kilometers, geospatial data and analysis are used to carefully plan economic growth and development, ensuring quality of life for its citizens. Potential property buyers can log on to Singapore's OneMap and view private residential property transactions to make more informed decisions when purchasing a home. Collaboration is key in Singapore. Beginning in 1959, Singapore attained self-government and set up many agencies to support the development of the fledgling nation. Today, Singapore's public service includes approximately 70 agencies under 15 ministries and an initiative for the entire government to share geospatial data with both public and private sectors and the community. As the country has matured, Singapore has faced challenges and opportunities that fall outside the traditional boundaries of each agency. While each agency is accountable for its individual roles, cross-agency issues have to be addressed so the public views the government as one seamless institution. The Singapore Land Authority (SLA), the national land authority and one of the leading geospatial agencies, began the nation's networked government initiative back in the 1980s. SLA first formed when the Land Office, Singapore Land Registry, Survey Department, and Land Systems Support Unit merged. The agency is a statutory board under the Ministry of Law focusing on land resource optimization through development and regulation. SLA is responsible for all aspects of managing state land and buildings, from land sales, leases, acquisitions, and allocation to developing and marketing land-related products and maintaining the national land information database. Today, SLA is driving the Singapore National Spatial Data Infrastructure (NSDI) with the Infocomm Development Authority of Singapore through the Singapore Geospatial Collaborative Environment (SG-SPACE) initiative. The primary goal of SG-SPACE is to unlock the potential of public-sector geospatial data to be shared and the cocreation of innovative services by public agencies, businesses, and communities. A longtime user of Esri GIS technology, SLA uses ArcGIS for Desktop and ArcGIS for Server to provide maps and applications over the web, for example, through OneMap. OneMap is one of the successful outcomes of the SG-SPACE initiative. It is a collaborative, common platform for public agencies to share geospatial data and deliver services to the public. Agencies such as the land development and land transport authorities; the ministries of Community Development and Education; and those responsible for schools, youth, and sports use OneMap. The initiative provides a window to public-sector geospatial content through a common map platform that can be used to easily deliver map-based services and information. Visitors to the site use icons to navigate Singapore, starting with an index map of the country. 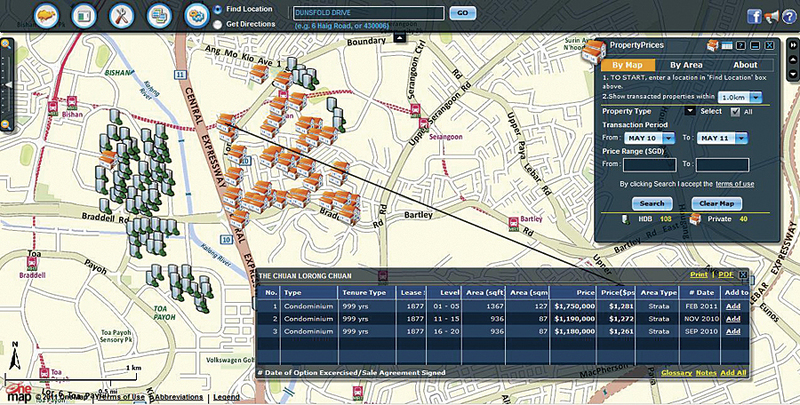 Users can view either street maps or land lots or both using a slider to change the transparency of the data layers. Searching and navigating are made easy through the use of an icon for themes. This provides a drop-down list of location information on community, health, and environmental services throughout the island. Places of interest, such as museums, inexpensive food complexes (called hawker centers), child care services, and parks and sports centers, can be easily found. One pioneering application is the National Parks Board's Parks Live application. With this application, the public can now explore parks in Singapore using mobile phones as guides. The application shows a person's exact location and helps navigate within the park, providing interesting facts along the way. Other applications provided through OneMap include searching for street addresses and finding directions to and from locations. Maps can be bookmarked to refer to at a later time, printed, and/or saved. Users can measure distance and area and draw temporary graphics on top of the map. Vincent Hoong, Singapore Land Authority's chief executive, explains that the nation faced challenges that all nations face as they implement NSDIs. "The biggest challenge we have faced is obtaining good, authoritative data. Authoritative data [is] that closest to the source that collects [it] and [is] authentic and accurate for the functions [it was] intended and developed for." SLA found that it was impractical and duplicative for one agency to collect all the data. Instead, each agency relied on the others for data sharing and application development. Since many data owners are reluctant to grant indiscriminate access to their data, SLA uses a policy framework to guide data owners on security and confidentiality. Applications are linked directly to OneMap through the services and gallery icons, which provide drop-down lists of linked applications. Examples of services created include volunteering opportunities based on location, interest, and availability; hot spots for bird watching; retail promotions based on locations; and research on competition and market profiling for businesses at specific sites. Locations of emergency services, as well as water-level readings from 90 sensors located on canals and drains to monitor flooding, can be viewed. One service that has proved to be particularly popular is SchoolQuery, which allows users to find out whether their homes are within one or two kilometers of a particular school. Services continue to be added. The latest services include Space2Lease, which provides viewing opportunities of SLA and Housing and Development Board (HDB) properties available for lease in Singapore. The PropertyPrices service allows users to view the latest transacted prices for both private and HDB properties in Singapore. A navigation tool provided as an iPhone app for OneMap is also available in the Apple App Store. Keeping abreast of new trends and innovative applications has helped Singapore create an integrated government that provides comprehensive services to the public. "Many decision makers have not realized and do not fully appreciate the potential and value of geospatial information," says Hoong. "It is only when people can appreciate the value of integrated geospatial information that efforts to increase data sharing, geospatial adoption, or application development can take root." Hoong attended the 2011 Esri International User Conference to accept the Enterprise GIS Award from Esri president Jack Dangermond in recognition of the achievements of Singapore's SG-SPACE initiative. For more information, contact Ming Khai Lim, Singapore Land Authority (e-mail: lim_ming_khai@sla.gov.sg). For more information on how GIS is used for spatial data infrastructure, visit esri.com/sdi.